When he sleeps, the hunt begins.When a young hunting guide from a remote island in Alaska is found brutally murdered, his naked body is discovered in the Cascade Mountains outside Seattle-the shocking pinnacle to a grisly Totem of body parts. Nathan Applewhite is the fourteenth victim of a cunning serial killer who targets and stalks young men. With the body count escalating, FBI profiler Ryker Townsend and his specialized team investigate the gruesome crime scene. They find no reason for Nate to have mysteriously vanished from his isolated home in Alaska before he ended up in the hands of a sadist, who has been taunting Ryker and his team in a sinister game of 'catch me if you can. 'But Townsend has a secret he won't share with anyone-not even his own team-that sets him on the trail of a ruthless psychopath, alone. The intuitive FBI profiler is plagued by recurring nightmares-seen through Nate's dead eyes-that slowly chips away at his mental stability. Is he burning out and losing his mind-becoming unfit for duty-or is the last victim reaching out to him from the grave? Townsend sees horrific flashes of memory, imprinted on the retinas of a dead man, the last image Applewhite saw when he died. Ryker must piece together the fragments. Each nightmarish clue brings him closer to a killer who knows how to hide in plain sight and will see him coming, but when the dead man has the skills of a hunting guide, he has the perfect ally to track down a killer-the last victim. 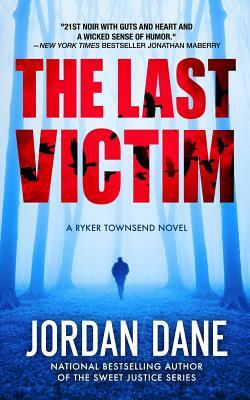 Bestselling critically-acclaimed author Jordan Dane's gritty thrillers are ripped from the headlines with vivid settings, intrigue, and dark humor. Publishers Weekly compared her intense novels to Lisa Jackson, Lisa Gardner, and Tami Hoag, naming her debut novel NO ONE HEARD HER SCREAM as Best Books of 2008. Dane also prns young adult novels for Harlequin Teen. Formerly an energy sales executive, she now writes full time and shares her Texas residence with two very pampered rescue dogs.